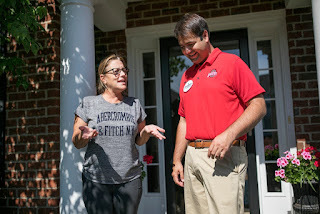 Danny O'Connor in red shirt, canvassing. The 12th Congressional District of Ohio hasn't elected a Democrat since 1980. A special election there for the US Congress is now rated a tossup by the Cook Political Report. The Democrat, Danny O'Connor, could be the next indication that the 2018 blue wave ain't no mirage. Apparently, Democratic turn-out in early voting in heavily Republican areas bodes well. Early voting numbers always signal political energy -- who has the edge, which team can't wait to get in the game? The Republican candidate for the open seat tries to paint O'Connor as a puppet of Nancy Pelosi, which hardly works at all any more, especially since O'Connor has already announced that he won't be voting for Pelosi as Speaker, should the Dems take control of the House.